From open prairie to shaded wetland, natural beauty abounds at Fakahatchee. The Fakahatchee Strand Preserve State Park: Florida’s largest (but maybe least-known) state park offers numerous day hiking opportunities, ranging from a 2,000- foot boardwalk to hip-deep swamp slogs. 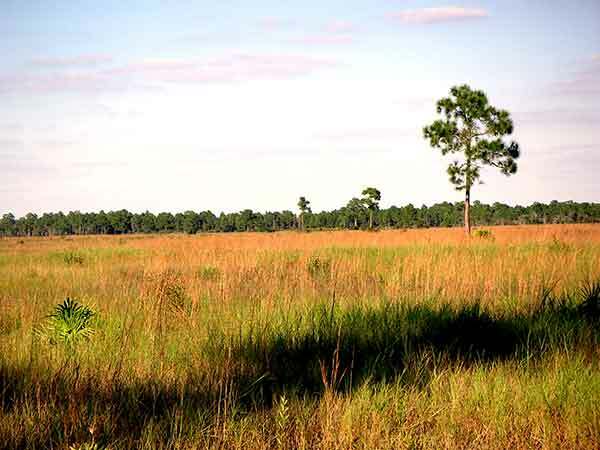 The breadth of flora and fauna you might encounter is almost incalculable: not only is the 75,000-acre Fakahatchee the orchid and bromeliad capital of the world; it is also home to black bear and some rare wildlife species, including the Everglades mink and Eastern indigo snake. Less adventurous hikers can see gators, a bald eagle nest and numerous kinds of birds from the safety of the Big Cypress Bend Boardwalk on the north side of U.S. 41 seven miles west of S.R. 29. But heading out on your own off the Janes Memorial Scenic Drive off S.R. 29 near Copeland is a lot more exciting. That’s where you are most likely to see up close some 44 species of native orchids (plus a few exotics that landed here from Africa) and 14 native bromeliads. Follow numerous tramways intersecting the Janes that stay high and dry all year long, or wade out into the swamp shaded by a canopy of bald cypress and royal palm. Hikers have reported spotting bear, otter, deer and gators in a single day trip.